The purpose of this work is to consider the spiritual beings and entities that work behind the phenomena and processes of Nature, and to raise as far as possible the veil that keeps the interconnections and work of these entities invisible to our eyes. The only two ways to recognize their existence and work is to find as many tracks of their 'footprints' on the physical plane as one can, or to develop our higher organs of perception. Otherwise it will be impossible to achieve any objective results, and one either will be lost in idle fantasy or be in denial of their existence and influence. In the distant past and to varying degrees, everybody was clairvoyant. Nowadays most people have lost their clairvoyant faculties and have to rely solely upon their physical senses. The loss of clairvoyance was a necessary step for mankind, so that we could be fully immersed in the material realities and the kind of thinking that goes with this perspective - one with no spiritual hierarchies. 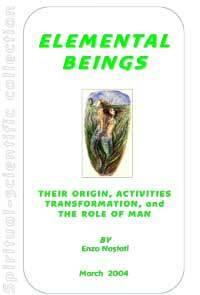 Humanity's task is to metamorphose this attitude into one that recognises the etheric soul and spiritual planes, and to develop the forces and faculties that allow the evolution of the kingdoms below him (animal, vegetable and mineral).